I guess we all know how we can use coconut oil to maximize its benefits. But, little do we know about its composition. What are the components of coconut oil that make it so amazing? It isn’t just a great tasting oil that you can use anywhere. It’s made up of minerals and nutrients that all adds up to its awesomeness. Coconut oil is extracted from a coconut kernel. It can either be refined or unrefined. Most households keep a jar of coconut oil as it can be beneficial on numerous occasions. Lauric acid is the dominant MCT in coconut oil which makes it the second most attainable source of the acid next to a mother’s breast milk. The calories in coconut oil come from fat. You may think badly about fats, but our body needs it. These fats will absorb vitamins, promote the production of hormones, protect your organs, and help keep your body temperature normal. 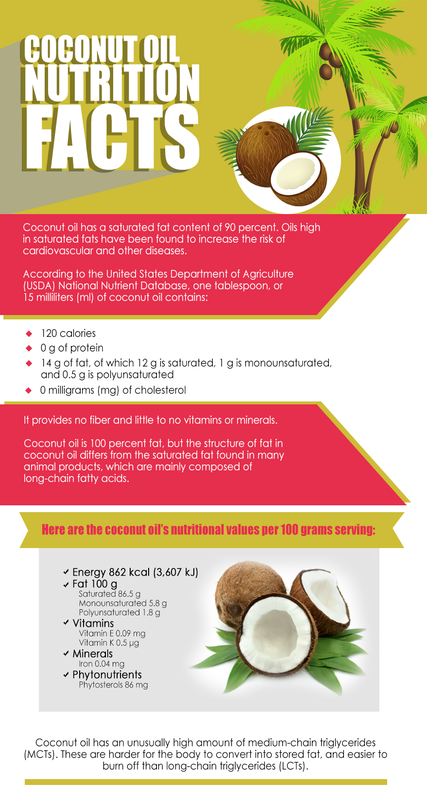 A tablespoon of coconut oil contains 13.5 grams of total fat. Note that each gram of fat is equivalent to 9 calories. So, a tablespoon of coconut oil contains about 120 calories. Coconut oil may not be too rich in micronutrients. But, it still contains a trace amount of them. The particular mineral found in coconut oil is iron. It’s important in the transportation of oxygen in the body. It also contains sufficient amounts of vitamin K, and E. Vitamin K helps in wound healing while vitamin E works as an antioxidant that protects your skin cells from damage.